Height: 6' 3" Weight:235 lbs. Born:March 24, 1962 in Morehead City, N.C.
Background: With all due respect to the likes of Rickey Jackson, Tommy Myers, Sammy Knight and others, Vaughan Johnson is the hardest hitter to ever wear the black and gold. Nicknamed "Meat" or "Super Collider" by teammates and media, Johnson arrived from the USFL in 1986 with new head coach Jim Mora and immediately made his mark, playing in all 16 games as a rookie. By 1987, he was a starter and he played in every game for the next four seasons. Johnson totaled over 100 tackles in three different seasons, including a career best 114 in 1988 to go with a pair of sacks and an interception. Paired with Sam Mills on the inside of the 3-4 defensive scheme of Steve Sidwell, Johnson the pair were a beast to opposing runners. Having totaled over 100 tackles in three different seasons, Johnson managed a career best 114 in 1988 to go with a pair of sacks and an interception. 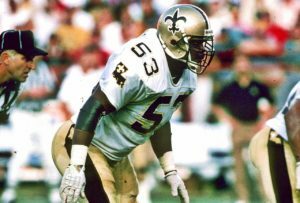 Paired with Sam Mills on the inside of the 3-4 defensive scheme of Steve Sidwell, Johnson the pair were a beast to opposing runners. While Mills was extremely intelligent, Jackson was bullish and Swilling was lightning fast, Johnson was perhaps the most feared by opponents because of his physical nature. Johnson was easy going, soft spoken off the field and was perhaps the most unheralded, least appreciated member of the Fab Four. "I do not think I ever coached anyone or saw anyone who hit harder than Vaughan," said Mora. "He was a terrific football player and a great guy to coach and a great guy off the field." Greatest Moment: It was Nov. 29, 1987. The New Orleans Saints had won four straight games after Jim Mora's famous "coulda, woulda, shoulda" diatribe following a very tough 24-22 loss to the dynastic San Francisco 49ers in the Louisiana Superdome on Oct. 5. The Saints were determined, young, tough and hot. On a cold day in Pittsburgh, the Steelers had every chance to come away with a win but Johnson and the Saints defense would not let them do so. Trailing 20-14, on first-and-goal at the New Orleans four-yard line with under four minutes remaining, Johnson stopped Rodney Carter at the two-yard line. On second-and-goal, Merrill Hoge carried and Johnson was the first man in on the stop at the one-yard line. On third down, Mark Malone had Frank Pollard open in the flat in the end zone for what would have been a score but Jackson deflected the pass. On fourth and goal from the one, Johnson took out the lead blocker, allowing Jim Wilks, Sam Mills, Brett Maxie to tackle Pollard short of the goal line. The Saints went on to get another stop late in a 20-16 victory to clinch the first winning season in franchise history en route to the first playoff appearance in franchise history. 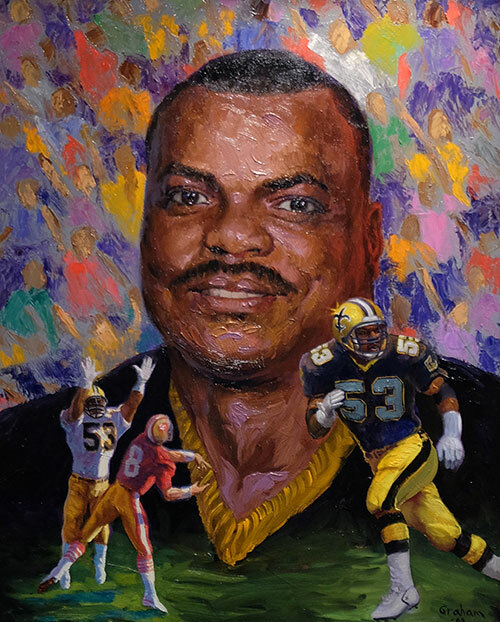 Honors: Johnson was inducted into the Saints Hall of Fame in 2000. He was named first-team All-Pro in 1988 and 1989. He made the Pro Bowl in four consecutive seasons from 1989-92. He was inducted into the Louisiana Sports Hall of Fame in 2011.